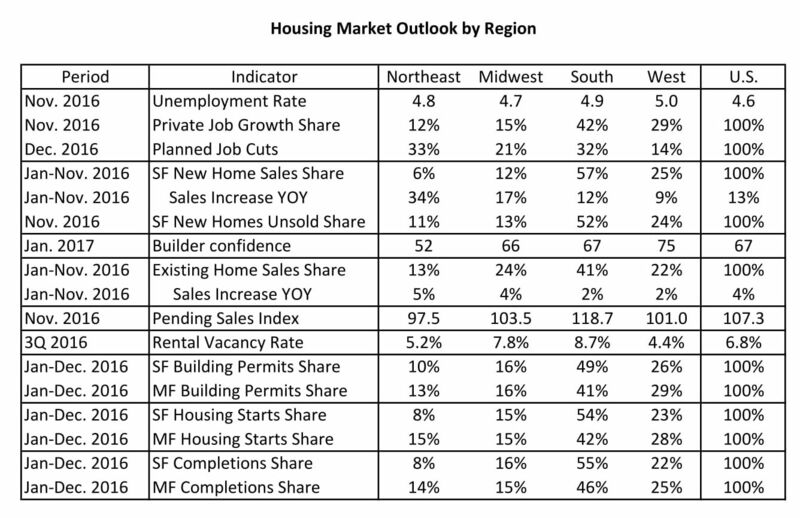 Although all signs continue to point to a positive year ahead for the national housing market, that doesn’t mean the gains and opportunities will be evenly shared. As in years past, it will likely be the South and West regions out-performing against the Northeast and Midwest. Looking first at where the jobs are, however, it was in the Midwest and the Northeast where the unemployment rate was the lowest in late 2016, with the highest rate noted in the West and the South. Yet it was in the South where most of the private sector job growth occurred (42 percent), followed somewhat distantly by the West (29 percent). Although the Midwest and the Northeast may have lower overall unemployment rates, their capture of job growth ranged from just 12 to 15 percent. Another snapshot of the employment picture is planned job cuts at the end of 2016, with the Northeast and the South together accounting for nearly two-thirds of the total; the fewest planned job cuts would take place in the West and the Midwest. In other words, it’s possible that unemployment rates in the Northeast and South will inch back up in the months ahead. In terms of new single-family home sales through the first eleven months of 2016, nearly 60 percent were sold in the bustling South region, followed distantly by the West, the Midwest and the Northeast. Yet it was the Northeast which saw the greatest year-on-year sales increase of 34 percent – double that of the Midwest and roughly three times the rate of the South and West. In terms of market balance, while the share of unsold homes in the Northeast indicates more excess supply, in the South demand continues to run slightly ahead of supply. Not surprisingly, builder confidence remained strongest in the West and South in the first month of 2017, yet was also almost as positive in the Midwest, and lowest in the Northeast. As it did for new homes, the South region also dominated the share of existing home sales through most of 2016, with over 40 percent of the total, or nearly the combined share of both the Midwest and the West. Yet, it was again the Northeast which noted the largest year-on-year sales increase of five percent – a point higher than in the Midwest and more than double the rate of the South and West. Nonetheless, for pending sales the South continues to outperform both the nation and the other regions, and it also posted the highest rental vacancy rate in the third quarter of 2016. 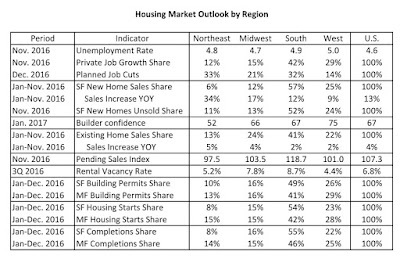 In the housing-crunched West, vacancy rates were just 4.4 percent. Looking ahead to the rest of 2017 based on building permits and housing starts in 2016, the South will likely continue to capture 40 to 50 percent of both single- and multi-family construction, with another 25 to 30 percent reported in the West. Of the remainder, about 15 percent will be built in the Midwest, and 10 to 15 percent in the Northeast. Similar numbers were also noted for completions throughout 2016. As a final caveat, however, past is not prologue, especially with a new Presidential administration likely to impact the housing market in various ways. These changes could include higher mortgage interest rates due to increasing inflation and housing finance reform as well as worsening labor shortages related to more stringent immigration enforcement. However, we could also see increased demand due to lower income taxes and fewer regulations. If nothing else, 2017 should be quite interesting. My column for the January 2017 issue of Builder and Developer magazine is now posted online. For this issue, entitled "A Look Ahead to 2017: Higher Interest Rates and Tight Inventory," I discussed what we might expect for the housing market with a new Presidential administration. For 2017, the International Monetary Fund (IMF) is projecting global growth of 3.4 percent (2.2 percent for the U.S.) versus 3.1 percent in 2016 (1.6 percent for the U.S.), with this higher growth rate attributed mostly due to greater stabilization for energy and commodity prices as well as continued low interest rates. To read the entire January 2017 issue in digital format, click here.